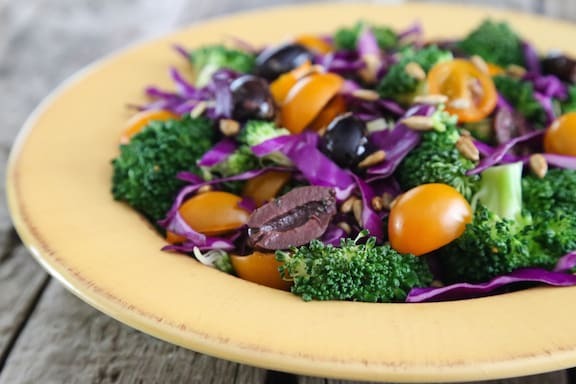 Dress this simple and pretty salad of broccoli, red cabbage, cherry tomatoes, and olives with a tasty salsa salad dressing, or just use any favorite dressing. This adds color and crunch to the dinner plate. Photos by Evan Atlas. Combine the first 4 ingredients in a large salad bowl and toss. Dress as desired with salsa salad dressing or oil and lemon juice or vinegar and toss again. Season with salt and pepper. Add a sprinkling of sunflower seed and toss again. Note: If you prefer your broccoli lightly steamed rather than raw, by all means do so. 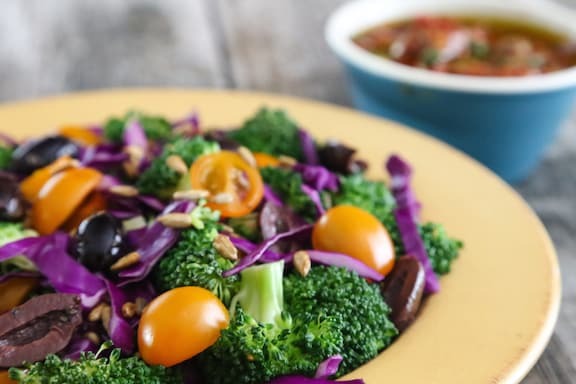 Steam the broccoli briefly in a small amount of water just until bright green, then drain and rinse until cool before proceeding with the salad. 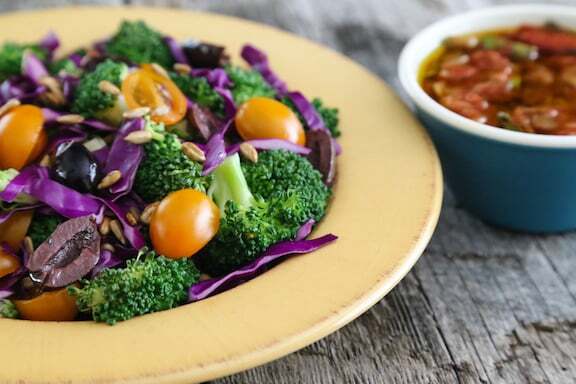 Explore more of VegKitchen’s Super Savory Salads. Here for more broccoli and cauliflower recipes. Looks so colourful Nava. I prefer to lightly steam my broccoli first. It’s not quite the same trying to chomp your way through raw broccoli. Always best to make your own dressing I think as store bought ones often contain sugar or other unhealthy ingredients. Thanks, Sandy. I agree about the broccoli — light steaming makes it more palatable for me, as well. There’s a note to that effect at the end of the recipe, not sure if you noticed. As for dressings, there are a lot of good natural brands like Annie’s but I try not to be lazy and make my own, as store-bought dressings are quite expensive.